Sony's long-rumored Smash Brothers-style brawler may finally be on its way. Rumors regarding a game known simply as Title Fight (a supposed PlayStation-exclusive fighter featuring a wide cast of Sony's most iconic characters) have been swirling since late last year. Yet, unlike most internet hearsay floating around out there, those concerning Title Fight had legs. Serious legs. Everything from the name of the developer, to photos of its team working on character models, to a few actual screengrabs of the game itself seemed to scream legitimacy. So, perhaps we shouldn't be surprised that Sony recently registered the domain for www.playstationallstarsbattleroyale.com and www.playstationallstars.com, or that SuperBot Entertainment, the company behind project "Title Fight," has started that whole "post cryptic messages" thing that studios just love to do before a big announcement. 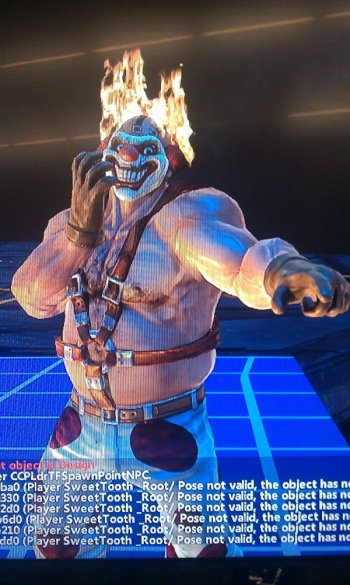 While Sony has yet to release any official information on what PlayStation All-Stars may actually be, or its connection (or lack thereof) to the game previously known as Title Fight, the pieces fit too nicely to be ignored. Aside from the overwhelming evidence that such a game has already been in development by SuperBot, that developer also just so happened to finally start its own Twitter page at nearly the exact time Sony nabbed the two domains, inaugurating the account with a simple message: "Boot sequence initiated... "
If the game is real, and the rumors are true, PlayStation All-Stars: Battle Royale will feature over twenty characters, including Kratos, Parappa the Rapper, Nathan Drake, Sly Cooper, Fat Princess, Colonel Mael Radec and Sweet Tooth. There's also been mention of Jak & Daxter, LittleBigPlanet, and Hot Shots Golf-themed stages, which likely implies the inclusion of those characters as well. Either way, with SuperBot firing up for an announcement, and Sony snapping up URLs, we'll hopefully learn of the actual details soon enough.